Juno and the Paycock is a definite must see at the Shaw Festival this season. Not only is the play one the best by Irish playwright Seán O’Casey (1880-1964), but it is one of the greatest of the 20th century. Jackie Maxwell directs the powerful production with precision, passion and insight. And the acting of the ensemble cast is simply unsurpassable. With Juno, the Shaw Festival rather belatedly completes Sean O’Casey’s “Dublin Trilogy” of plays set among the tenements in Ireland’s capital during the Irish War of Independence. The first of the three, The Shadow of a Gunman (1923) was the first play not by Shaw that the Festival ever staged back in 1965. The Festival staged the third of the three, The Plough and the Stars (1926), in 2003. The middle play, Juno and the Paycock (1924), is the only play not to deal directly with the “Troubles” but part of its point is that even people like “Captain” and Mrs. Boyle, who think they have nothing to do with politics, are inevitably affected by them. The Boyle family is held together entirely by the strength of the mother, Juno (Mary Haney). She is the only one of the four who works and feeds the family. Her husband, the so-called “Captain” Jack Boyle (Jim Mezon) struts about like a “paycock” but refuses to look for a job because of crippling pains in his legs that mysteriously appear whenever men come around offering work. He claims, “There’s still a little bit of spirit in me yet”. He spends all his time with his best “butty” Joxer Daly (Benedict Campbell), whose flattery encourages Boyle’s worst instincts. Joxer is merely an opportunist since he is quite ready to criticize Boyle behind his back or when the two fall out. Of the Boyle’s two children, Mary (Marla McLean) is on strike with her fellow workers and Johnny (Charlie Gallant), once active in the IRA, has been made an invalid with a bullet wound to the hip and an arm blown off by a bomb. With the arrival of a Mr. Bentham (Gord Rand), a schoolteacher studying to be a solicitor, the fortunes of the Boyles change completely. A distant relative of Boyle has left him a huge amount of money. On the strength of the coming inheritance, the Boyles refurbish their shabby apartment and wardrobe on credit, Mary and Bentham become an item and the family hosts a celebration of their good fortune. The one ominous event that mars the celebration is that the Boyles unthinkingly hold it the same day as the funeral of Robbie Tancred, Johnny’s former best friend, who was killed by the Free State supporters. The fact of politics and death literally intrude on the Boyles’ festivities when the funeral procession led by Mrs. Tancred (Jennifer Phipps) enters the Boyles’ apartment and Mrs. Tancred’s lamentations supplant the Boyles’ raucous songs. has greater financial prospects. All the while, Johnny feels guilty for a misdeed and is simply waiting for the retribution to arrive. 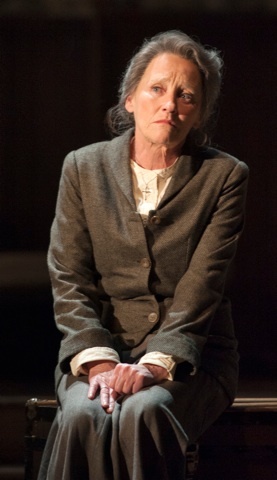 As Juno, a kind of female Job and one of the great roles in Irish theatre, Mary Haney gives a magnificent performance. From Juno’s quick-witted humour to her utter despair, Haney has the full measure of a woman whom a hard life has worn down but who still has the grace to recognize her own failings. After so many comic roles it is wonderful to see how Haney still commands the stage in a major serious role just as she did as Saint Joan back in 1993. 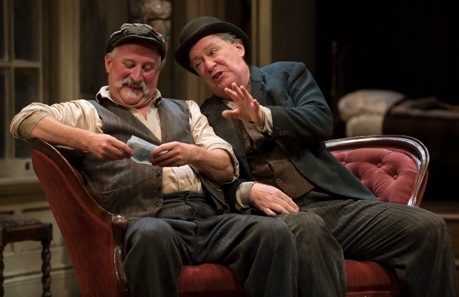 The characters of Jack Boyle and Joxer Daly are one of features that make O’Casey’s tragedy so unusual. Throughout the action O’Casey portrays them as comic. Boyle’s bravado in public and cowardice in private, his grandiloquence about his time at sea which may be entirely fictional, his convenient malingering and utter selfishness are highly amusing even as we recognize they are detrimental to his entire family. Joxer as a parasite and flatterer who continually tempts Boyle away from familial duty is even worse but O’Casey makes his contrivances so transparent to us they are comic. Portraying him as a kind of Irish Falstaff, Mezon conveys both the broad humour and the underlying ignobility of this fascinating but abhorrent character. Some may wonder why Campbell adopts a peculiar nasal voice as Joxer, but his natural deep resonance would seem out of place with Joxer’s weasel-like nature. In their scenes alone together, Maxwell brings out the absurd humour of their interactions that immediately looks forward to the camaraderie in the midst of mental haze of Vladimir and Estragon in Beckett’s Waiting for Godot (1953). All the roles, no matter how small, are well taken. Marla McLean shows us all too painfully how Mary moves from personal vanity and talk of “principles” to a “ruined” woman even she herself despises. Charlie Gallant brings such a strong aura of disquiet with him whenever he is on stage we can tell that Johnny is struggling with a fear he can’t reveal to anyone. Gallant carefully escalates Johnny’s guilt-ridden pain until the agonizing climax of his final exit. Gord Rand masterfully plays Mr. Bentham, a character ironically named after Jeremy Bentham (1748-1832), the founder of utilitarianism. Rand’s Bentham is all surface smoothness and control who, unlike his namesake, follows the Theosophist notion that the world we see is not real. Not only is this a peculiar notion for lawyer to espouse, but it strangely allies him with Boyle. Bentham may meditate to make the world go away; Boyle merely has to drink enough to do the same. As the mourning Mrs. Tancred, Jennifer Phipps has a short scene that absolutely stops the show. She, amidst her black-clad troupe not only looks like she has taken on all he cares of the world but, through infinite suffering, has become a kind of oracle. With Phipps, Mrs. Tancred’s entrance into the Boyles’ apartment is like a supernatural visitation whose words they can ill afford to neglect. Yet, at the height of their happiness, the Boyles are only to eager to shut out Mrs. Tancred and all she represents. Designer Peter Hartwell has done nothing to mitigate the shabbiness of the Boyles’ lives or the tackiness of the improvements they make while expecting wealth. As director, Maxwell beautifully navigates the play’s ever-shifting mood between comedy and tragedy so that both exist and enhance each other. This allows her to make Boyle’s famous final line – “Th’ whole worl’s in a terrible state o’ chassis” – as funny as it is devastating, Boyle having been a cause as much as a victim of the chaos he speaks of. The chance that we will see this great play again with so fine a cast in so fine a production is so small that all theatre-lovers should make a point of seeing the Shaw production while they can. Photos: (from top) Mary Haney, Jim Mezon, Marla McLean and Charlie Gallant, ©2014 David Cooper; Mary Haney as Juno Boyle, ©2014 Emily Cooper; Jim Mezon and Benedict Campell, ©2014 David Cooper..